Learning piano is not only fun but also serves as an extraordinary way to improve your state of mind. Since its invention in the early 18th century, the piano has enamoured music fans of all ages with its mellow and elegant sound. Though it failed to catch on at first, it rose to prominence in the 19th century as a sign of sophistication and status. Like most instruments, piano improves both children’s IQ and marks in school. However, learning piano can have a substantial impact on adults as well. The longer you play the instrument, the stronger its effects on your well-being. So, what are all of the benefits to learning piano? Well, truthfully, we cannot fit them all on one page. What you will notice, however, is that there is a large variety. You can continue reading to learn more about the benefits of learning piano! Hand dexterity refers to your ability to make quick and precise movements with your hands and fingers. People improve their hand dexterity through practice and repetitive motions. If you play the piano on a regular basis, you will see significant improvement in your hand dexterity over time. This occurs as you become faster and more graceful. The biggest developments in dexterity occur at an early age. Therefore, young children stand to benefit the most. However, older players will notice a significant improvement as well, especially since both the fingers and hands are involved. Improving your dexterity will prove to be useful in other facets of life as well, including sports and work. For the best results, you want to make sure you practice good form. When learning to play piano, whether through a teacher or on your own, pay close attention to the form of experienced pianists. If you work hard to mimic these motions early on, your muscle memory will serve you well when you become an intermediate player. Playing the piano is a soothing experience. When you sit down in front of a piano, you can set all of your personal issues aside and focus on the beautiful music you make. You end up getting lost in your own world. Often times, you will notice that you seem a lot happier after some time on the keys. But that is not just a placebo effect. In fact, playing the piano actually causes your body to release endorphins, which are the hormones that make us joyful. This will pay dividends for your health, as your blood pressure will improve as a result of less stress. Even a 10-20 minute piano session can have you kissing your tension goodbye. As we learned earlier, playing the piano boosts the IQ and grades of students in school. Children who begin learning piano early demonstrate superior cognitive development compared to children who do not. However, young children’s brains are not the only ones that benefit from learning piano. The brains of older individuals do as well. When you play an instrument like the piano, multiple regions of your brain have to work in unison. This keeps your brain active. Playing the piano also changes your brain for the better, improving both your auditory and motor functions. Additionally, learning piano increases the volume of white brain matter. This is key for older individuals because you tend to lose white matter as you age, which can increase your risk for stroke and mental issues. All of this is just further proof that piano can help anyone live a healthier, more fulfilling life. Getting really good at piano takes a lot of hard work and dedication. However, you do not need to be a master of the piano to build up your self-esteem. There are songs for each skill level, and all of them can be extremely rewarding. As you get better at something, no matter what it is, you get more confident. The confidence extends way beyond the keys on the piano. Furthermore, piano recitals can provide an opportunity for kids to break out of their shell and perform in front of a crowd. If you are an adult, you can show off your skills at social gatherings. You will receive many compliments for your abilities. It is important to remember that very few people play the piano and even less are good at it. When you become a part of the minority that is good at the instrument, your self-esteem skyrockets. Learning how to accept criticism is a viable asset. It can help you analyze yourself in other areas of your life as well, forcing you to improve and become an all-around better human being. Through the help of a piano instructor, you will gain the ability to handle criticism better. The purpose of piano lessons is to gradually improve. You will realize that in order to improve, you need to correct your mistakes rather than ignore them. Younger children will learn to respond with logic rather than emotion, and adults will learn how to assess their own behavior. Furthermore, piano competitions can contribute to the growing for kids. Well, you might come to find out that piano is your passion. You will never know unless you try it. The best part about this hobby is that it is inexpensive. Once you have your piano, you do not need to constantly spend money on it. You have unlimited music available on the internet. If you get really good a piano, you can even turn your passion into a part-time job. You can end up teaching other people how to play, or you can also make money performing at parties and social gatherings as an amateur pianist. If you struggle with concentrating on one task, you are not the only one—far from it. In the modern world, people get easily distracted. The average person’s attention span is just about 8 seconds and plummeting. So what can you do to slow down the chaotic world around you? Well, learn how to play the piano, of course. The fact is that learning piano takes a lot of mental concentration. When you are in the middle a performance, you do not have time to take your fingers off the keys and check your smartphone. Playing the piano requires you to read the music and hit the right notes at the right time. The entire experience captivates you from start to finish. Eventually, your ability to focus on one task at a time will improve drastically. Do you want to get out and meet friends more? Learning piano will allow you to do just that. First, you gain access to a whole new social group that you most likely never interacted with before. You can connect with them on anything piano-related, and possibly even make many new friends. This also provides a great way for shy children to make friends and interact with other children their age. Once the child gets older, they can start to perform in an orchestra or a band. Learning piano also gives you something to talk about, whether with strangers or friends. Anytime you find yourself short on words during a conversation, you can sneak in a few lines about your beloved hobby. Chances are that you have a lot of creative energy flowing inside of you. Learning piano gives you a brand new outlet to express yourself. This may seem odd at first, particularly if you have not played an instrument before. However, you will notice that expressing your feelings through music is just as, if not more, powerful as doing it through words. After you learn several pieces of music, you can play songs that suit your emotions at the time. If you are happy, you can play a song that makes you tap your feet uncontrollably. When you are angry, you can pound away at the keys while playing Symphony No. 10 in e minor. The best part is, you will never run out of new songs to learn! Eventually, you will get so good at your craft that you will experiment with your own sounds and music. This is where the real creative juices start flowing. Learning any instrument is valuable. No matter what instrument you choose, you will experience many health and developmental benefits. However, the piano has several unique advantages that make it worthwhile to learn. The piano can help reduce your stress, improve your hand dexterity, and become more social. It can even help you stay focused in a world where the average attention span is dropping every year. As we have seen, learning piano provides a long list of both mental and physical benefits. It is a wonderful hobby for people of all ages, and it is never too late to learn a new instrument! If you want to read more about piano, continue reading our blog. 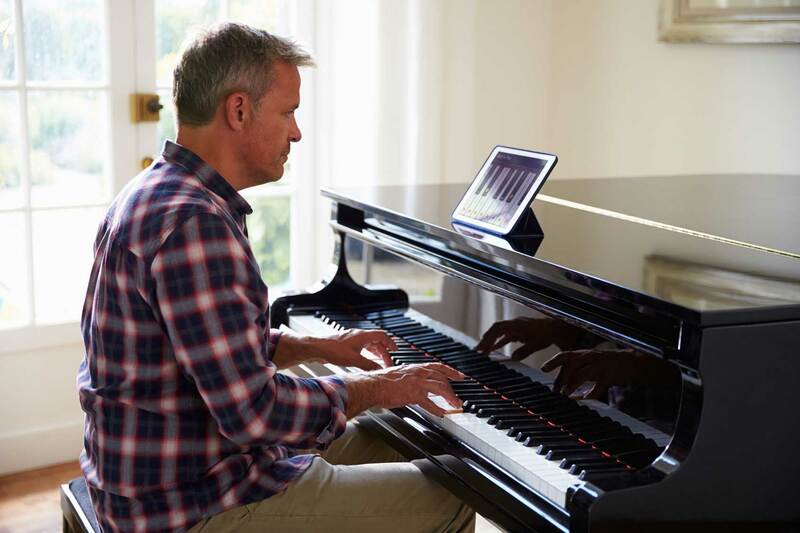 If you are looking for a fun way to learn how to play the piano, check out The One Smart Upright piano.